Climate change has been an important and trending topic of late, but it grabbed the headlines in a new way this summer with tarmac-melting heat in Phoenix, Arizona and a heatwave in Europe dubbed “Lucifer.” And less you think this is press-driven hyperbole, this summer also saw the release of new research that climate change really is causing more frequent and intense heatwaves, especially for urban areas. The urban heat island effect, which causes cities to be hotter than surrounding areas with more natural land surface, is not a new phenomenon—it’s been documented since the 1830s—but in recent years it has taken on more urgency, especially as the world’s population starts to concentrate more and more in cities. And as temperatures around the world increase, so too do heat-related health risks. And while climate change effects everyone, it hits some people harder than others—especially the poor. Urban heat islands are most prevalent in lower income neighborhoods, where residents are also less likely to have air conditioning or easy access to public cooling centers. Heat is almost always more dangerous for elderly citizens, who often face a similar lack of access to cooling, and less social support systems. Climate change is not just an environmental issue—it’s a social justice issue, too. Trees also provide another significant public health benefit: they reduce fine particulate matter air pollution, a problem that contributes to 5 percent of all deaths worldwide each year. 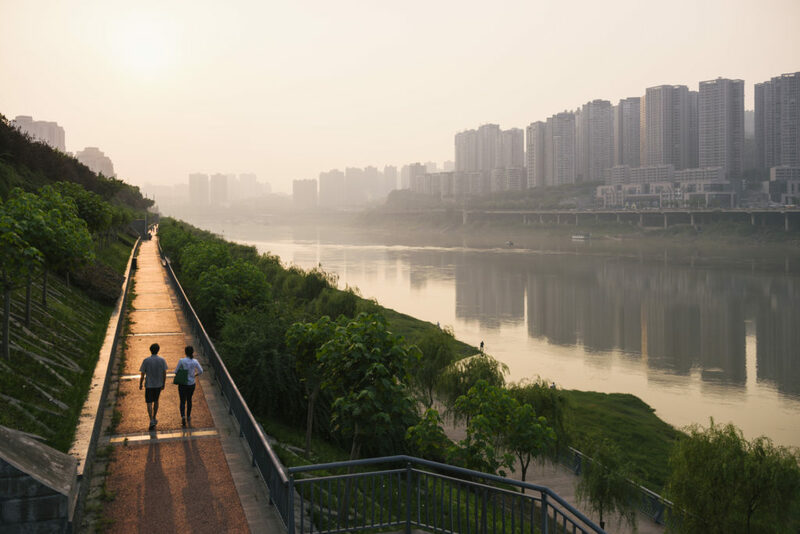 Our organization, The Nature Conservancy, has carried out a study of 245 cities around the world that stand to benefit from tree-planting initiatives, assessing their efficiency and return on investment. 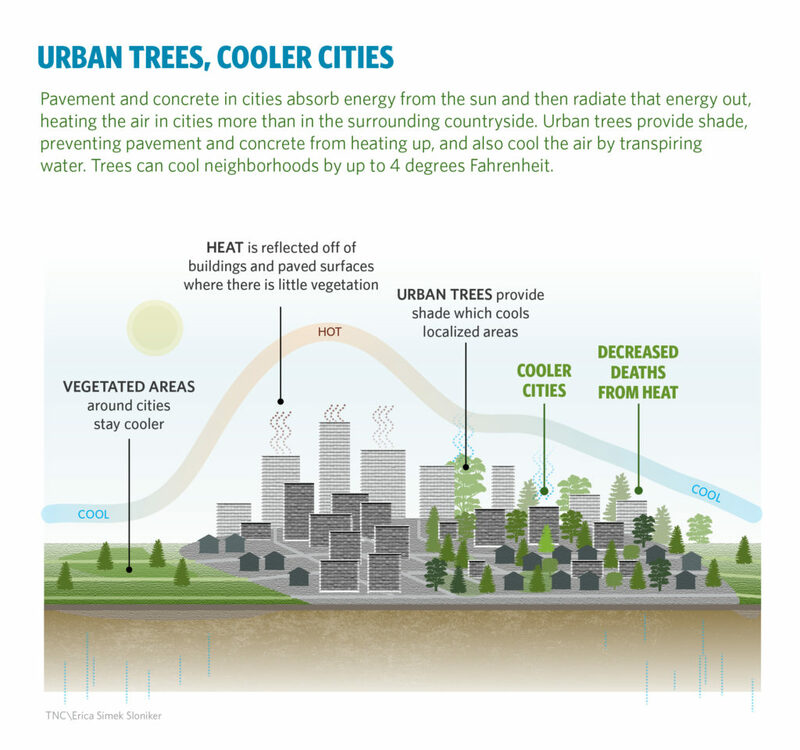 Compared to other ways to cool outdoor air temperatures and reduce fine particle matter, trees deliver similar benefits per dollar spent—and, planting trees is the only intervention that addresses both air pollution and heat. On top of these public health benefits, urban trees provide habitat for wildlife, reduce storm-water runoff, and sequester carbon from the atmosphere, which helps to mitigate climate change. And if these social and environmental benefits aren’t incentive enough, consider the economic benefits: a recent study published in the journal Ecological Modeling estimated that trees in urban areas save megacities more than $500 million a year in public health costs, energy expenses, and environmental protection. Estimated that trees in urban areas save megacities more than $500 million a year in public health costs, energy expenses, and environmental protection. Trees are not a cure all, of course—it will take a comprehensive set of solutions to make our cities cooler and healthier, and it will take concerted action on the national and international level to keep the climate in safe boundaries, including further efforts to decarbonize our economies and more investment in natural climate solutions. But climate mitigation measures won’t do much to cool cities in the short term, and as anthropologist Merrill Singer points out in The Conservation, low-income and minority populations are often excluded from initiatives to adapt to climate change. City leaders have an imperative to address dangerous heat now—and to do so in ways that assist low-income neighborhoods and other vulnerable populations in particular. This is why planting more urban trees can be so beneficial. Because the most significant effects of trees are highly localized, they are most effective when planted in dense areas or targeted to particular areas of need, including those low-income neighborhoods that often have limited existing tree cover. Most important, local communities don’t have to wait on approval to plant trees—municipal leaders can lead the way on implementing this strategy now. If we want cooler, healthier, more equitable communities, now is the time to start planting. Pascal Mittermaier is the Managing Director of Global Cities at The Nature Conservancy. Explore the Conservancy’s latest thinking, science and recommendations on nature and cities at Global Solutions.